Case Studies — Blind Renaissance, Inc. When a trio of fruit marketing companies came together and approached Blind Renaissance to develop a look for their new brand, we wanted to try something sweet and cool. Using black, which had not yet been used in the produce industry, we made the fruit pop against a dark background with glittery, transparent ice sprinkled in the foreground. This look was shot for apples, pears, cherries, and a mix of all three. These photographs would then be corrected and prepared to use for displays and POS materials. Since 2004, we have helped to shape the continued success of Chelan Fresh. Beginning with a new logo, our design team has worked collaboratively with Chelan Fresh to continually seek high-impact solutions to marketing challenges. By implementing and maintaining a cohesive vision throughout diverse domestic and international campaigns, our work has elevated the Chelan Fresh brand identity as a symbol of quality. Between 2011 and 2012, Chelan Fresh experienced a 58% increase in overall market share in the U.S. market and beyond. We provided Chelan Fresh with sophisticated tools to effectively reach two distinct audiences: retail stores and the consumers who shop in them. 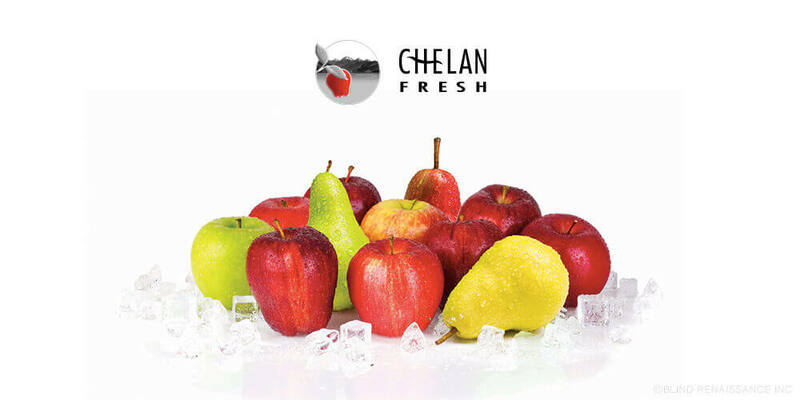 Applying a long history of produce industry expertise, we developed account and point-of-sale materials to help sell Chelan Fresh both as a full-service grower/packer/shipper and a consumer brand. Nothing showcases fresh design and premium produce like custom photography. Our photography studio continually updates our photo library of high-quality commodity and package photography for trade ads, promotion, and retailer use. The black look was quite popular and used for many years, but Chelan Fresh wanted a refresh. 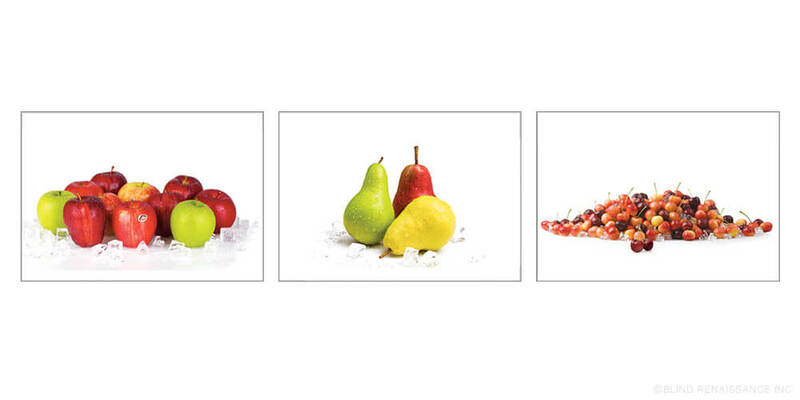 To brighten and "refresh" the look, we reshot the same concept of apples, pears, and cherries with ice, but on a white background this time around. The same look was applied to displays and POS materials and paired with bright, colorful text to stand out on clean white packaging and displays. Using photos taken in our studio, we developed a custom promotional calendar for Chelan Fresh. Designed to be a useful retailer resource, each month features a Chelan Fresh promotion, information on growing regions, and merchandising tips for the coming month.